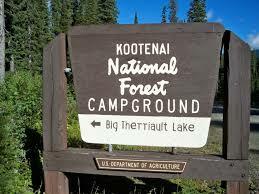 The campground is adjacent to Big Therriault Lake and is pack in pack out. 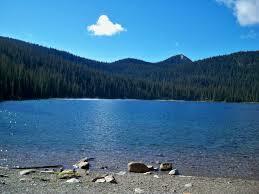 The lake is very pristine as if looking through glass. The Big Therriault Loop Trail is a 1-mile gorgeous hike. 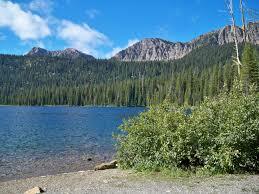 Fishing for Cutthroat Trout is popular on the 45-acre lake. There are 10 sites each with a table and fire ring. Vault toilets and 1 hand pump water spigot available. Open all year with services available July 1 through August 31. Snowmobile accessed from December 15-April 1. $5/day fee with a maximum stay of 14 days. From Eureka, MT, take US Rt. 93 south 7.7 miles to Ten Lakes sign and Grave Crk Rd. Turn left onto Grave Crk Rd. 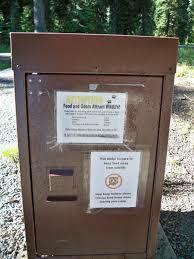 and go 14.3 miles to the intersection of Forest Rts. 319 and 114. Continue straight onto Rt. 319 for 13.9 miles to where Forest Rt. 319 intersects with Forest Rts. 7116 and 7085. Continue straight onto Rt. 7116 and go 0.4 miles to campground sign. 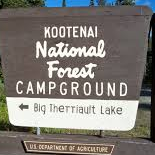 Turn right at sign into campground.